Spend time away from the cruise ships at Rhodes Port, and head out to see the island's highlights on a 4.5-hour private shore excursion! Travel with a private guide around Rhodes, visiting the Acropolis of Rhodes, Filerimos village and the island's UNESCO-listed Old Town. Hear of Rhodes' Hellenistic history, and then finish with a tour of the Palace of the Grand Master of the Knights of Rhodes a monument as majestic as its name suggests. Meet your private guide outside Rhodes Port and travel around Rhodes Old Town (Rhodes city) a UNESCO World Heritage Site. Impossibly photogenic, the medieval neighborhood is best known for its intact city walls, so have your camera ready to capture photos as you pass alongside them. Travel to the summit of Mount Smith, a hill just to the west of Rhodes city, and then stop for a stroll around the Acropolis of Rhodes. Dating back to the Hellenistic period, the acropolis is one of the few Greek acropoleis without fortifications. Instead, the site is more of a collection of monuments, and your guide will introduce you to its best ones while walking around. See the Temple of Athena and admire the views around the acropolis as well as the island's urban attractions. Marvel at the nearby Temple of Apollo and gaze at modern city sights like Diagoras Stadium and Rhodes Port. Hop back inside your minibus and travel across the island to Filerimos village, built on the site of the ancient Doric city of Ialysos one of only three ancient cities in Rhodes. Stop to enjoy free time in the village, perhaps visiting the Byzantine Church of our Lady of Filerimos, the Chapel of Agios Georgios with its gorgeous 15th-century frescoes or the medieval Castle of the Knights. 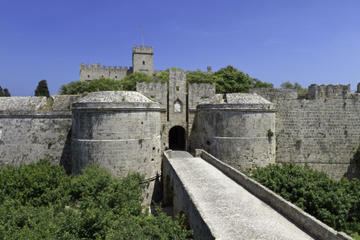 Meet your guide at the pre-arranged time and travel back to Rhodes Old Town for your walking tour. Amble around the medieval city walls to Porte d'Amboise the Old Town gates. Stroll down the Street of the Knights, admiring its medieval buildings with their eye-catching facades, and then head inside the Palace of the Grand Master of the Knights of Rhodes. Explore the impressive fortress, admiring its intricately detailed mosaics and relics while learning of its medieval history. Return to your coach, and then finish your Rhodes shore excursion with a drop-off at the island port. We will ensure your timely return to Port of Rhodes for this activity. In the rare event your ship has departed, we will arrange for transportation to the next port-of call. If your ship is delayed and you are unable to attend this activity, your money will be refunded. See our terms and conditions for full details.